We pick up where the last issue leaves, with Col. Flag facing off against Killer Croc. June Moon agrees to change into the Enchantress, if Flag agrees not to kill Croc. Hack talks to the digital ghost of Capt. Boomerang, and is discovered by the rest of the crazed inmates of Belle Reve. Enchantress transports Croc and Harley to the black vault that houses Zod's body. Zod wakes up and starts making short work of the soldiers surrounding him. Killer Croc and Enchantress try to stop him also, but fail. Zod picks up Amanda Waller by the throat and is about to kill her, when Harley manages to strike him with some power cables, running millions of volts of electricity through him. This opens up a window for hack to hit Zod with a "virus," which happens to be the digitized essence of Capt. Boomerang. Passing through Zod, Capt. Boomerang somehow manages to regain his body, while Zod is left standing mindless. With sanity restored to the entire complex, Harley is again discovered to have returned to insane state. Story - 4: The conclusion to this storyline really felt like a high octane, Jerry Bruckheimer third act to a summer blockbuster. Yes, there were parts to this story that were almost formulaic, but it was a fun ride. There were a lot of similarities to the recent live action film. Which I'm sure is by design. The twist with Zod, being almost a barbarian conqueror was a nice change. It was established that his body had been mutated by his time in the Phantom Zone. I'm sure we haven't seen the last of him yet. He is a blank slate now, one that Amanda Waller will surely exploit. 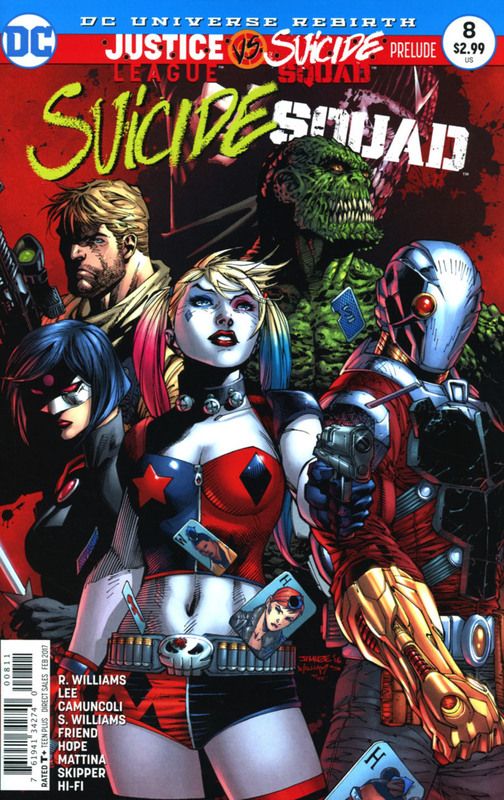 A good balance of humor, action and suspense, with the backup story about Killer Frost being introduced into Belle Reve, this book will now directly lead into the Justice League vs Suicide Squad upcoming event. I hope that Waller will attempt to use Zod during that, or at least lay the groundwork for her to do so in the future. I want to see what Superman will do when he discovers that Waller has a crazy Kryptonian despot at her disposal... Or at least his body. I like the Fire and Ice aspect of having El Diablo and Killer Frost on the team. Should be very interesting to see how that plays out. Art - 5: I can't say enough about how much I have enjoyed Jim Lee's work on this book. I'd imagine this may be his last issue, as he moves onto something else. Again Lee was able to juggle a wide cast of characters and action sequences with ease. One notable thing was, the Enchantress costume, it looked so awesome, far better than the skimpy, Harley Quinn duds. Just goes to show, over sexualization of some characters isn't always a winner. I hope the following artist can keep the momentum rolling with the art. I can't leave without mentioning the colors. Alex Sinclair did not do this issue, but there isn't a change in the tone of the book at all. In fact, had I not been writing the credits for this issue, I'd never have realized that it was Jeremiah Skipper on the color duties instead of Sinclair. Cover Art - 5: Another poster like cover, I like them very much. I know that some fans prefer something a little more than characters standing around as if they are posing for a picture. The Lee Bermajo Variant of Harley Quinn is probably a little more fitting for the issue, and his work on the covers have been great so far.